For 179 days beginning in 1973 the City was terrorized by the Zebra Murders. During the murder spree four black men randomly killed 14 whites and attacked seven others. (The attacks were dubbed Zebra crimes because police dedicated the "Z" radio frequency to all communications related to the case.) One of the surviving victims was Art Agnos, who was shot on Dec. 13, 1973 outside a Potrero Hill daycare center. Agnos was then a consultant to the California Legislature's Joint Committee on Aging. He was later elected to the Assembly and was a one-term San Francisco mayor from 1988 to 1992. 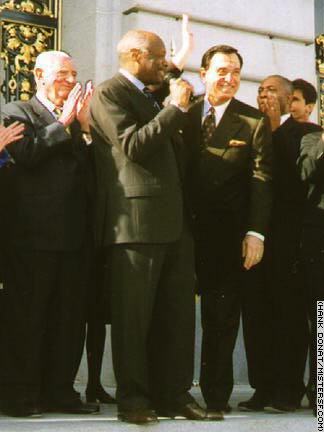 Agnos is seen here in 1999 with (L-R) former mayor George Christopher, Mayor Willie Brown, and others. Jessie Lee Cooks, Larry Craig Green, Manuel Moore and J.C.X. Simon, all Black Muslims, were convicted and sentenced to life in prison in 1976 for the Zebra Murders and related crimes.